I got out early Saturday and tested plywood booms. Between Saturday and Sunday I got 18 painted and ready to sell. Here is a photo of some of my EasyVees. I usually make these from 5mm 10 ply but had some room on a piece of 1/4 inch Baltic and traced a few more on that. When testing I was surprised to find the two versions flew almost exactly the same. As it was calm, the booms were landing about 10 feet to my left. They formed about a 6 foot circle so I was surprised how similar they flew. On the last throw, I immediately moved a few feet to my left and made an easy catch. Boy did that feel good. I tested a half dozen Skippys and 3 Fire hose booms too. Those are all painted now The Fire hose boom is awesome. It’s sort of like a retro hook in shape. It flies a low path that is fantastic. I really like it. 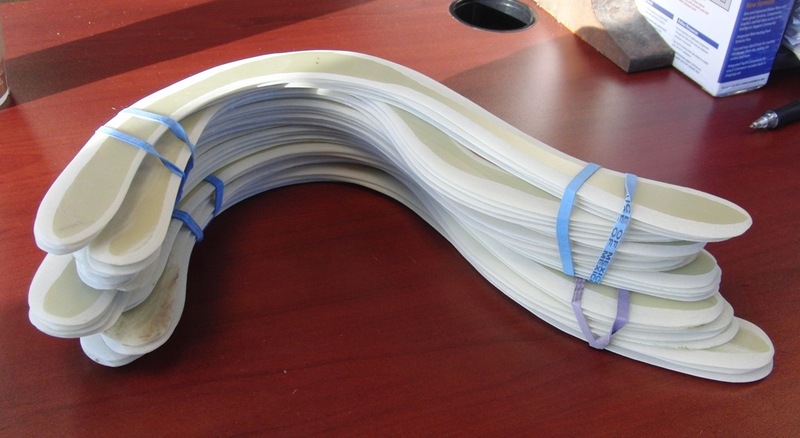 Look at this stack of long distance boomerangs I have to test. There are 27 in all. You would think I am smart enough not to test them in higher winds. Well, I was surprised how windy it was today when I got to the field. I tried out three types of boomerangs. The first up was the Swish. I held back on the power but discovered I was actually laying it out too much. After adjusting my throw, they were working pretty well, just ending up on the field behind me. Wind will do that. Next up were some 90% Voyagers. That's when the real trouble began. You know how LDs go out and up? Well as soon as they started heading up, the wind took over. I had four and the first three I had good spots on where they landed. The 4th one I tried to get a bit more into it, and it got out pretty far but I lest it on the return. I picked up all the others and walked the field trying to locate it. Three ladies came thru walking a bunch of large dogs and one lady found it, no where near where I thought it went. I switched to either 90% Voyager 6 shapes. Since there were 4, I would have tested an even dozen boomerangs. They were all blowing by me. The last throw I again pushed it a bit more and nearly lost my balance. Of course I also lost sight of the boomerang while trying to stay upright. I had to walk half the soccer field behind me before I found the boomerang. At that point I was tired from throwing and walking so headed back to work, where I could rest up. Progress, little at a time….. Weather and my schedule continue to mess up my boomerang building but I managed to get a bit done over the past few days. I started by setting up my router table outside so I could cut a 45 degree bevel on a bunch of 5mm and ¼ inch plywood blanks. If I have it set up correctly, it is easy work. I probably did about three dozen boomerangs this way, and only messed up one. I think I need a better insert near the bit. This one seems to allow the plywood to dip own a little and sometimes the blank gets under the bearing. That screws up the blank. It was rather fun working outside with the wind blowing 20-25mph. All that sawdust and shavings went blowing all over. I think I even ended up with sawdust in my underwear. Shifting gears, I decided to shape some G10 long distance boomerangs. Backorders keep piling up and if I get some made, I’ll be much better off. I think I managed to get a dozen shaped of various designs. Now the tricky part is getting them tested. For the past week we have been living in a wind tunnel. Today the winds are averaging 25 to 35 mph and gusting over 40. You really don’t want to test long distance boomerangs when you can’t trust where they may end up in higher winds. Sneaking another short boomerang building in on Easter afternoon was a real plus. My next project was to start shaping the plywood boomerangs I routed. I am trying to pick small, specific projects to do, since completing them give me some satisfaction of getting something done. 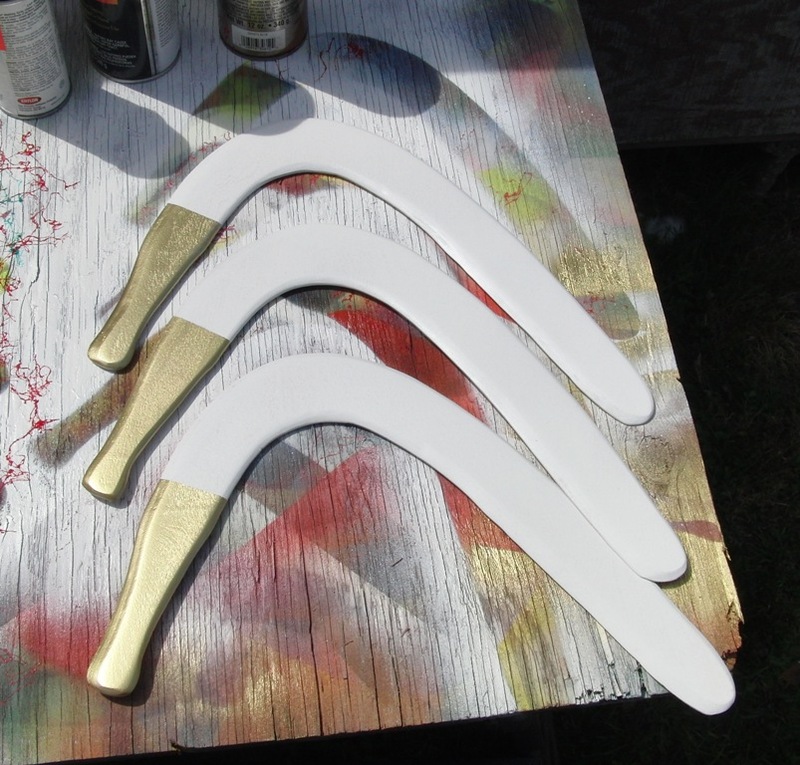 I grabbed a dozen blanks and shaped airfoils until I was satisfied with the result. 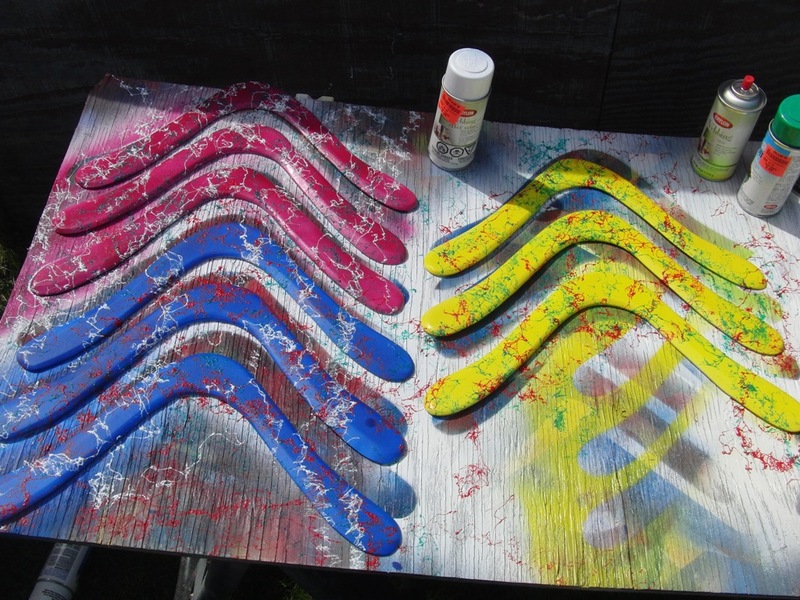 I now have a bunch (about 30) of boomerangs to test out. If this wind ever dies out some, I’ll be having fun on the field. I’m a cook, not a boomsmith! I haven’t touched a boomerang in a week. Many of my readers think boomerangs are my #1 hobby. Well long before I started making and throwing boomerangs, I learned to cook. I am pretty good at it and cook most nights at home. Now I am even involved in helping my wife with her Monday Lunch thing. 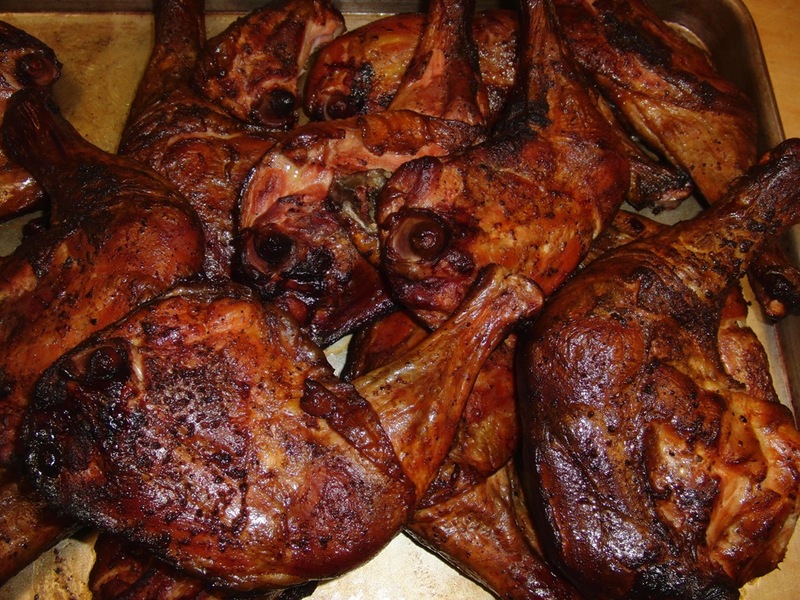 This past weekend it involved me smoking 40 pounds of chicken leg quarters and helping make the veggie side dishes. My unofficial role is dishwasher, pit boss, sous chef and purchasing agent. Sometimes the weekends get very busy. Where does this fit in with boomerangs? Well it often leaves me little time to work on boomerangs so my orders fall behind. In the last few weeks I have been trying to squeeze in some time but there are always roadblocks. Saturday would have been idea, partly because I was smoking chicken. I could fire up the smoker and as long as I kept tabs on it, I could set up some stuff in the yard and carve airfoils on booms. Well, the weather had other plans. It was cold not getting out of the low 40s. It was damp and at times rainy. I never had a chance. Sunday we were up at 4:30 to serve breakfast to the homeless women at the emergency shelter. We still had to make the sides to go with the chicken but I still thought I had a chance at boomerangs again. The phone rings and it’s a problem that my wife needs to fix on the computer systems she supports. That takes around 2 hours so I stepped it up to backfill in the kitchen. Everything was finally packed for delivery and as I helped load the car, it started raining again. It was a sign that I was not making boomerangs over the weekend. Oh well, maybe another day. Now the next Friday the priest was going around the town and decided to visit the newly-weds. But when he came into the house he got a whiff of something that he shouldn’t be able to smell in a good Catholic home on a Friday. “Mary, where’s Sam?” he asked.